Lazy, blowsy summer days are here. 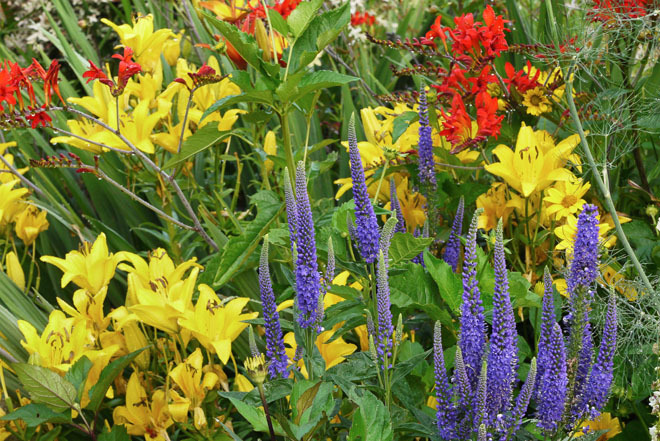 It is midsummer and the five perennial borders are in full exuberant growth. Six-foot-tall, bright yellow Asiatic lilies have been blooming all through midsummer together with brilliant Crocosmia ‘Lucifer’, and yet the lilies show no signs of fading until early August when they shed their last flowers. Crocosmia ×crocosmiiflora ‘Star of the East’, interplanted among them, carries on the show through late summer. Dark blue Veronica longifolia ‘Marietta’, bought solely for sentimental reasons because my sister’s name is Veronika, makes a beautiful counterpoint to the red crocosmia and yellow heliopsis daisies. The turf and black mondo grass−lined path has become narrower, as it does every year around this time. Since our garden isn’t a public garden, I like the Japanese idea of minor obstructions in the path to slow the hurried gardener or visitor and encourage a closer look at blooms and fluttering swallowtails or velvet-coated bumblebees sipping nectar. Bold or strident, depending upon one’s sensibilities, is the theme in this particular border. Hidden behind the stout banana, a patch of magenta-flowered phlox appears, intermingled with the same ‘Lucifer’ and backed by the vigorous golden sumac, ‘Tiger Eyes’, with lots of luscious green between. After the initial shock wears off, I find it invigorating, as long as it does not repeat to the point of visual exhaustion. Just like a rich dessert, a little is tasty, too much is cloying. Across the central path lies the south flower bed shaded by two dogwoods and a stewartia. 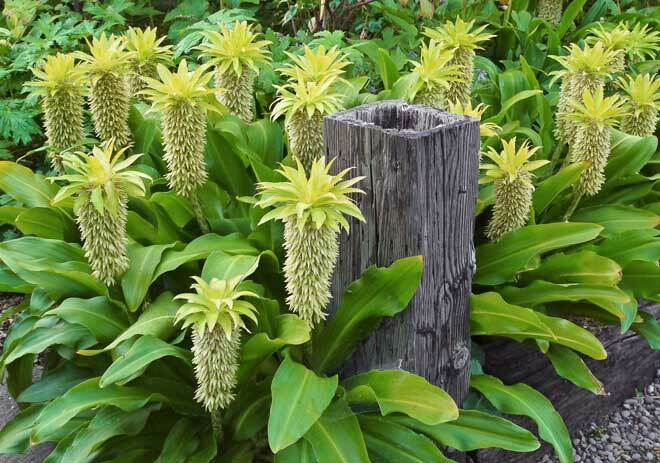 The entrance is marked by a large grouping of pineapple-helmeted racemes of starry-flowered Eucomis bicolor, dressed in skirts of strap-shaped leaves, looking bold and purposeful. Here, as in all woodland gardens, life has taken on green, quieter summer tones—a restful contrast. Late-blooming, tall and dainty, Thalictrum delavayi, with lacy leaves, has umbels of foamy pink on 6- to 8-foot stems that reach up through tree branches and drape themselves over black-leaved pink dahlias. The best and latest of the foam flowers is the double-flowered, albeit sterile, form, ‘Hewitt’s Double’, hard to find but well worth searching for at specialty nurseries. 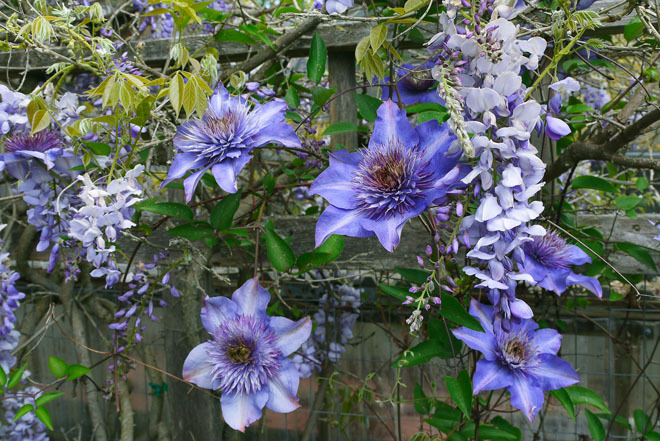 Blue-flowered Clematis ‘Rhapsody’ layers itself over and through two onion-domed obelisks at each end of the bed. With a maximum height of 6 feet, ‘Rhapsody’, blooming all summer, never outgrows its support, but with its dense habit covers it with a flower-studded mantle from top to bottom. 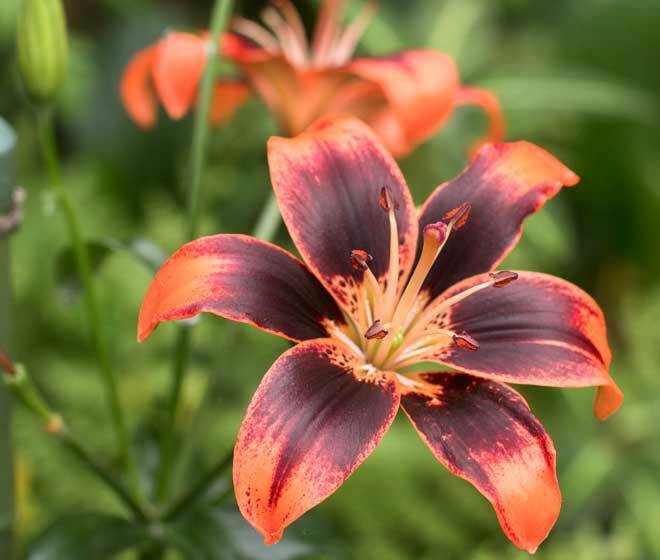 Heavenly scented oriental trumpet lily ‘Silk Road’ is planted throughout the bed. 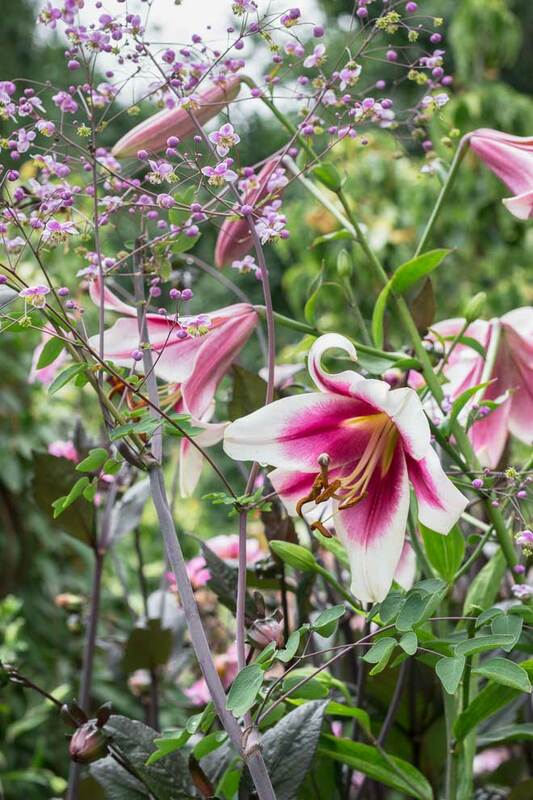 Six feet tall, with enormous white flowers and crimson-pink throats, its beauty and fragrance have made it one of the most popular lilies in northwest gardens. Its flowers last longer in semi-shade. 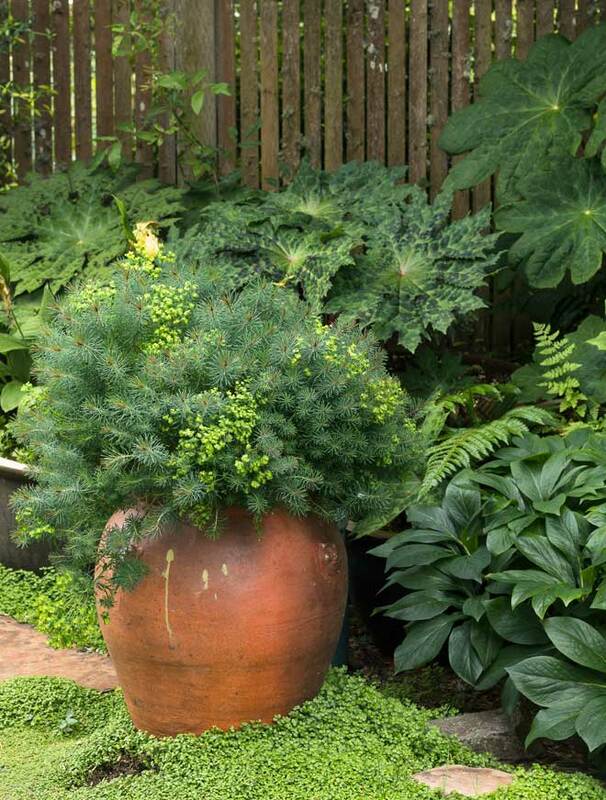 In the darkest areas under the trees grow summer-flowering Kirengeshoma palmata, maidenhair ferns, painted fern, and silver-centered Arisaema consanguineum, offering a change from the masses of blue delphiniums of earlier sun-drenched years when the trees were newly planted. How different the perennial beds appear now than in late spring. The vigor of erect spring growth has given way to full-flowered buxomness of leaning, mingling, sprawling growth. The invisible hand of the gardener has created magic. What looks like a spontaneous creation of flowers sharing space, of colors that complement each other is an illusion that is a large part of the art of gardening. 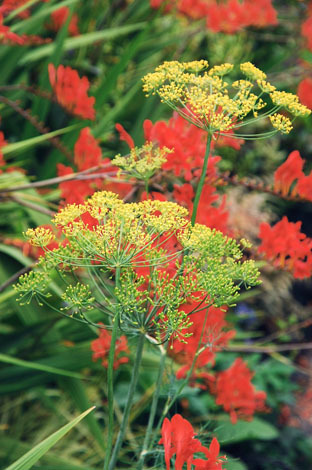 Dill seed from the adjacent vegetable garden sowed itself into the flowerbeds and became a masterful ingredient, tall, narrow umbels creating a bond between coarser leaved perennials. Allium christophii, vivid, metallic magenta in spring, now with straw-colored umbels, is left standing, holding up taller neighbors at the front of the border, until it finally disperses its seed and topples. Three more perennial beds along this path show no sign of the summer doldrums. Growth is so dense that most weeds are relegated to the lower darkness and a very thin existence. Deadheading and preventing seed production in order to prolong the flowering season are now the gardener’s most pressing chores. Sometimes a weaker plant needs to be rescued from an over-vigorous embrace of a burly neighbor. 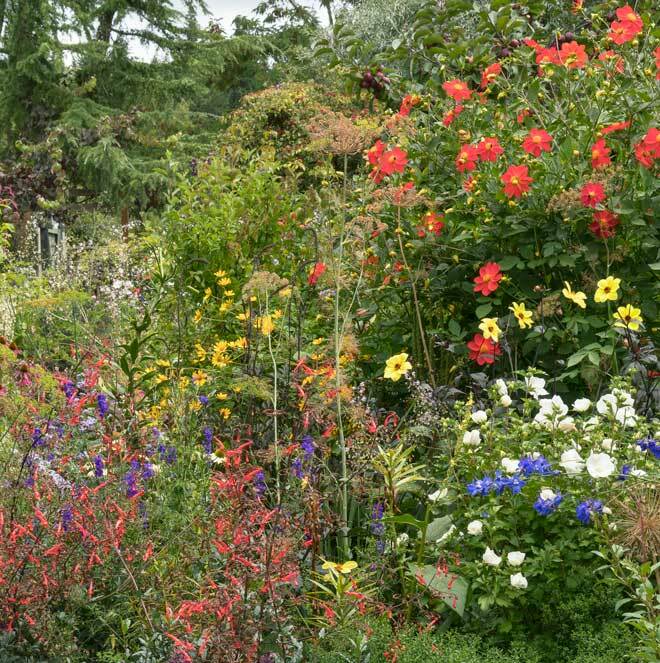 In this garden, it is hard to talk about midsummer blooming as studied combinations. Intuition is a gardener’s best companion. Some satisfying combinations in the not-so-dog-days of summer are the black-leaved, crimson-red dahlia ‘Mystic Enchantment’ and an equally velvet red nasturtium, a bit of straw-colored Allium christophii, and yellow Hypericum ‘Kolmoran’ Mystical Orange. A little self-sown larkspur here and there and the white, scented, Nicotiana sylvestris for evening pleasure, for both moth and man, are enriched by black mondo grass at the edges of the bed. For the aspiring summer-flower gardener, I recommend standing in front of your beds in spring and imagining shapes and colors of summer that will be pleasing to you. 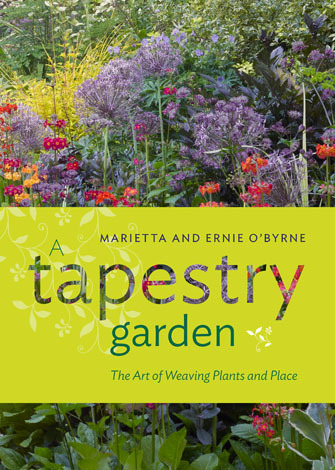 Then go to your spring plant sales armed with a vision for your summer garden. It may not all work out at first, but an undaunted gardener will try until utmost satisfaction is achieved. Don’t be swayed or intimidated by fads and fashion; the garden is there to please you, the gardener, first of all. 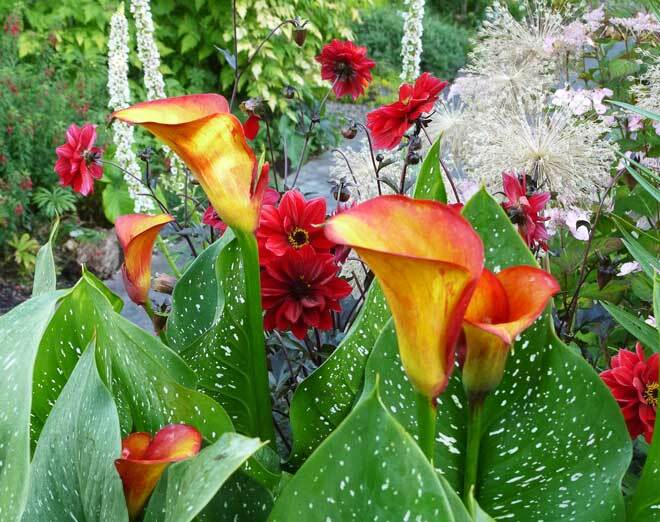 One of the most magnificent plants in our summer border is ‘Flame’ calla lily with giant, silver-shot leaves, and, as its name suggests, flaming spathes in red and yellow. 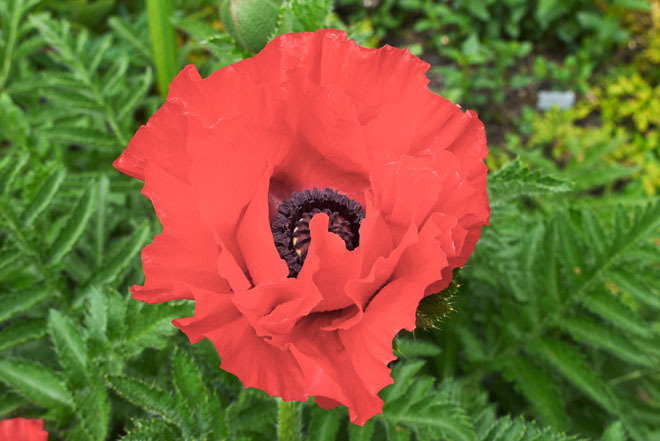 Many years ago I acquired a brilliant, true red Oriental poppy, ‘Tango’, in Germany. But Oriental poppies bloom in May, and then leave a big hole in the summer border as they go dormant. I spent much time meditating on that hole. Calla lilies, on the other hand, only rise from giant tubers in June. So, there was the answer. Two plants, one spot. They have been excellent companions ever since. 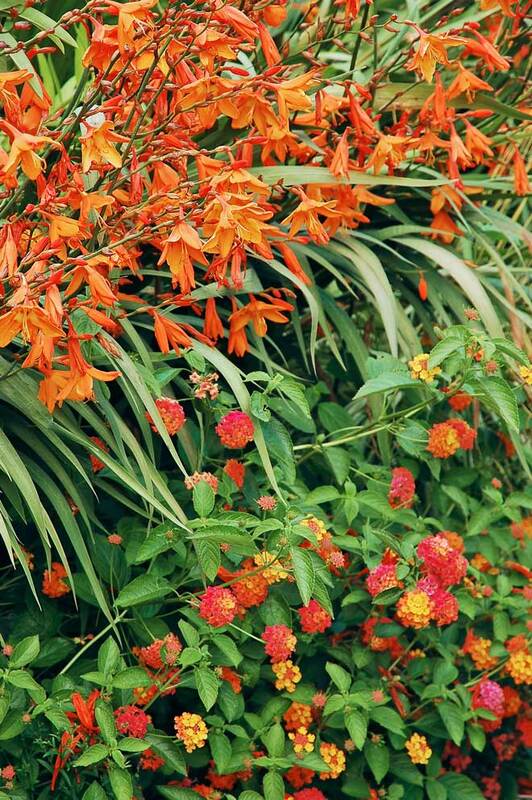 Various crocosmias can stretch the bloom season from June through September. Starting in June with red Crocosmia ‘Lucifer’, it continues with the yellows such as ‘Citronella’, followed by bright orange, mahogany-throated ‘Emily McKenzie’, light orange ‘Star of the East’, and ending with the smaller, nonspreading ‘Solfatare’, with sulfur-tinged green leaves and apricot- yellow flower spikes. All varieties are hummingbird magnets. A hint: If you are worried about the spreading talents of crocosmias, each winter after frosts, at cleanup time, cut crocosmias to about 1 foot and not to the ground. With the bed bare, it is easy to fork up unwanted bulbs. There is always a demand in the neighborhood, much more than for giant zucchini. by Timber Press, Portland, OR. Used by permission of the publisher. All rights reserved.